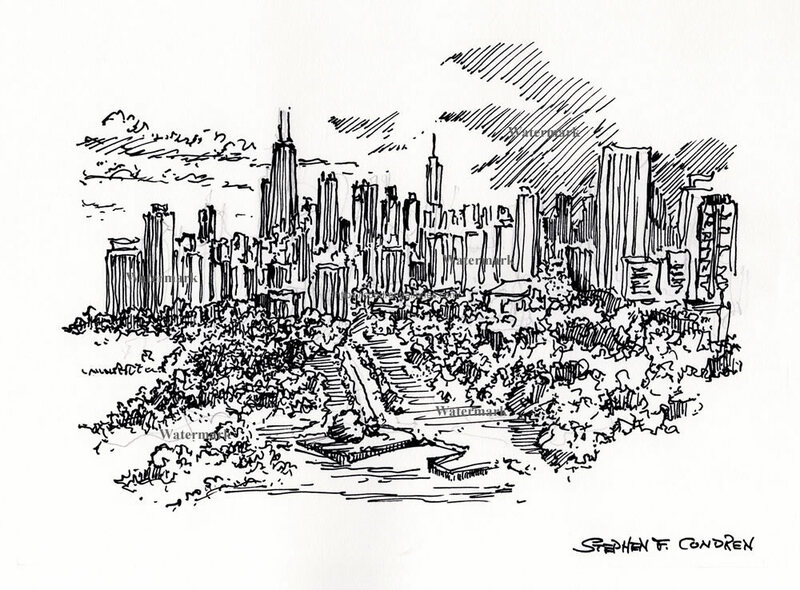 This article is about Chicago skyline #745B cityscape drawing, which is for sale here, at discount with prints by artist Stephen F. Condren, SAIC, of Condren Galleries, a Fine Arts Gallery, offering JPEG & PDF scans. This pen & ink drawing is looking south over the lawns of the zoo and Lincoln Park in Chicago. It is my goal in the rendering to offer the viewer a personal note about the subject. Being a native to Chicago I am partial to art about Chicago. Further, having graduated from the School of the Art Institute of Chicago it further underscores my love for this great city. I am from the south side of Chicago. I grew up in the Jackson Park Highlands with is in Hyde Park Township and just south of the great Jackson Park. Being from the south side we did not venture north as often as my mother would have liked. My mother grew up in Lakeview along the north shore lake. Mom always talked about here time growing up along the lake and how wonderful it was. So in honor of my dear mother whom I will cherish all of my life I dedicate this pen & ink drawing. I have made use of a fine line pen for this drawing. My intent was to use the foreground as a visual support for the skyline in the rear of the rendering. There are both cumulus clouds (on the left), and stratus nimbus clouds at the center and to the right. The contrasting line movement from these shape enhance the contour of the drawing. The skyscrapers in the background are many and most difficult to define. If you look carefully you can see the major super structures. Like any good drawing, it is best practice to use as few lines to convey the most meaning and that is what I have attained in this splendid rendering.